Do you have any “genius” recipes – ones that seem obvious when you read them but, for some reason, you couldn’t come up with on your own? I would like to share one such recipe called Quick Pasta Risotto. In order to avoid all disappointment, let me say right away that this is not your typical risotto recipe (a wonderful risotto recipe will soon make its way to the blog). And since I believe in full disclosure: no, I’m not the genius behind this recipe. This is a recipe for a risotto wanna-be that takes a lot less time and energy to make. This Quick Pasta Risotto is the type of recipe you make when you get home late because of the crazy traffic and you have all but 20 minutes to feed the kids, before running off to soccer or baseball or tennis or swimming or whatever practice you are running late for (because as parents, we are always running late for something…right?). Basically, what you have here is a recipe for a delicious meal that you can make with a few basic ingredients in as little as 20 minutes. I find myself making this recipe because it’s perfect for the evenings when you’re too tired to cook, or in a rush to get somewhere, or in need of some comfort food. There’s only one pot to wash, so cleanup is quick too. And, well, you have the added bonus that it tastes great! And the leftovers are great for lunch the next day. Are you in? Willing to give this a try? One of the ingredients in this quick pasta risotto is pancetta, a type of Italian bacon that is usually unsmoked. Feel free to exclude it if you are vegetarian. This recipe also calls for orzo, a type of pasta that has the shape of rice. This small pasta is a great addition to soups, stews, or side dishes. It can easily replace rice in any meal and it also makes for great salads. It cooks in no time at all. You will see that once you try orzo shaped pasta, it will quickly become one of your staples in your pantry. Once all the ingredients are combined, let them simmer for about 10 minutes and that’s it! Supper is served! Whenever I am channel surfing on TV, I always hope Nigella Lawson will magically appear. I love her passion for food and like so many of her viewers, I could just listen to her talk for hours on end! I was inspired by Nigella’s “Pasta Risotto with Peas and Pancetta” found in her cookbook Nigellissima. This Quick Pasta Risotto comes together in less than 20 minutes, so you’ll have lots of time to do the dishes (if you wanted to) before running off to soccer practice. Stir in the frozen peas, lentils and pasta. Reduce the heat to medium-low and simmer for about 10 minutes. Stir occasionally to prevent the pasta from sticking to the bottom of the pan. If necessary add more broth. When pasta is cooked, drizzle olive oil and incorporate with the cheese. 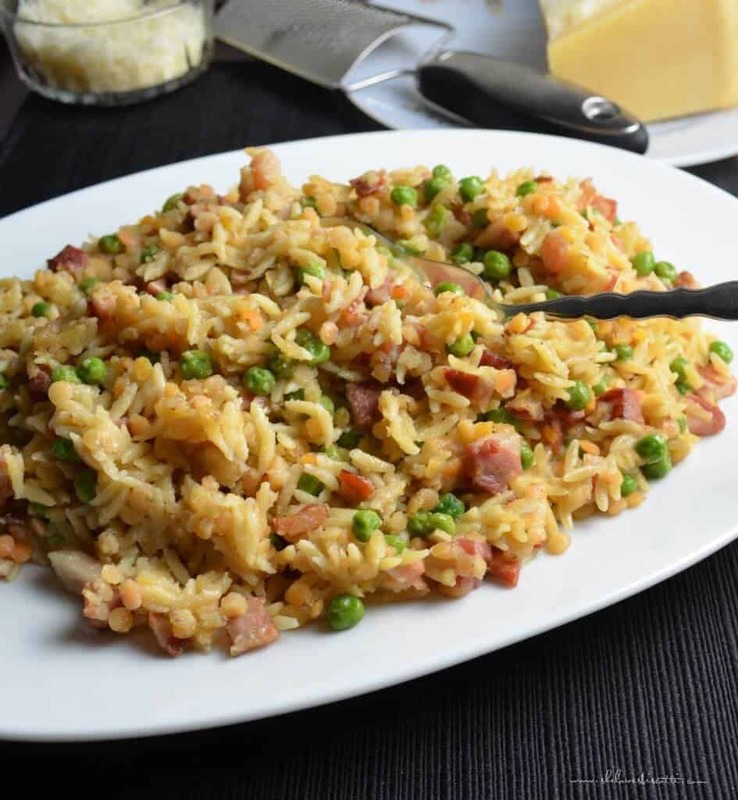 Do not rinse the orzo pasta when making this recipe as the starch contributes to the creaminess of the dish. I love all risottos… can’t wait to try this! I love this idea. If you ever get the time, apply the risotto method to orzo. I published my version on the site a few years ago. I’d be curious to see which version you like better.